Last month’s devastating earthquakes in Nepal were caused by the collision of the Indian subcontinent crashing into and (partly) under the bulk of Asia. The Himalayas are being created by the collision of tectonic plates. So, where are the volcanoes? That’s what I was asked when a friend wanted me to explain the Katmandu disaster. Well, there are no volcanoes in Nepal. Nepal has huge mountains, of course, but not every mountain in the world is caused by a volcano (only a small percentage are, actually) – and relatively few nasty earthquakes are triggered by volcanoes. The nearest volcanic activity to Katmandu is a thousand kilometres northwest, in western China, where an eruption last occurred over 60 years ago. The action in far western China has produced a few cones, but no volcanic mountains. No one was hurt when the 1951 Kunlun cone erupted. In fact, the eyewitnesses – a road crew working in the excruciatingly remote region – reportedly said, “What the heck was that?” when the 1951 volcano shook and smoked. Then they went back to work. Before that, the last Kunlun Volcanic Group eruption was in 1850. To say the place is volcanically quiet is an understatement. And these are the nearest to Nepal of any volcanoes. The Himalayas are not on fire. There are no fire-spitting volcanoes in the Himalayas, yet most people think of volcanoes when they think of earthquakes, mountains, and (Opa!) breaking plates. A “ring of fire”, for example, surrounds the Pacific Ocean with, well, a ring of volcanic fire. But there’s the rub – an ocean of water lubricates the subduction zones surrounding the Pacific. Ironically, water allows the ring of fire to exist while the lack of an ocean of water in the landlocked Himalayas quenches any possible volcanic action there. When India and Asia collided 90 million years ago, the continental crust of the Indian tectonic plate sank under the Asian plate, deep into the Earth’s mantle, to a depth of 200 kilometres or more. It was a continent-on-continent convergence of rock. Sans water, except perhaps a bit that got mixed in when India first arrived from across the sea, from present-day Madagascar. But that was 90 million years before Nepal’s current borders were drawn on a map. Why is water so important? Water decreases the melting point of rock. When water is conveyed into Earth’s deep nether places, solid rock down deep may melt. 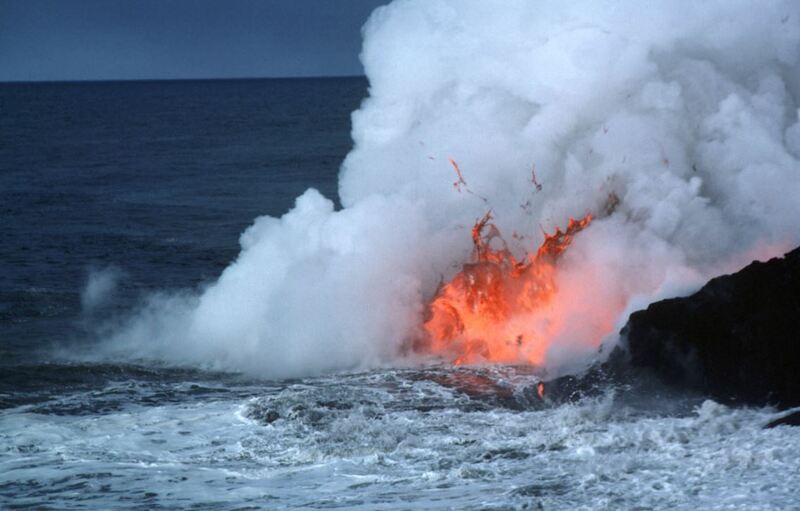 The making of a volcano requires runny magma – melted rock. Oceanic plates have water-saturated sediments and crust, at least in their shallower sections. In places like Chile, Tonga, and the American Pacific Northwest, those wet sediments and oceanic crust end up deeply buried where the water vaporizes, rises, melts overlying rock, and forms volcanic magma. In the Himalayas, water doesn’t entire the mix. Instead, continental crust collides and piles up into mountains. No water, no melted rocks, no magma, no volcanoes. Just deadly earthquakes instead. This entry was posted in Geology, How Geophysics Works, Oceans, Plate Tectonics and tagged earthquakes, Himalayas, Nepal, subduction, volcanoes. Bookmark the permalink. No water deep within to cause volcanic destruction, yet the water that seeps in from the surface causes more earthquakes : http://naya.com.np/@developer.naya/post/729d1883fa9fa28c7555572c6e6d720a Nature is weird! S.Kumar. – Thank you for this link. The article is interesting, but is almost entirely about micro-earthquakes caused by hydraulic fracturing and water injection in oil wells. As the article states with regards to the possibility that heavy rain may cause earthquakes: “But this idea, as many other theories, are untested and thus do not provide a definitive outlook.” We also note that the recent tragic earthquake in Nepal happened during the driest time of year, before the monsoon rains. Nevertheless, it is an interesting piece about water and quakes. Interesting article explained a lot about no volcano in Himalaya . 1. The volcanic zones of convergent Continental plate margins do not have the continuity of volcanoes eruption as several gaps( volcanic free zone ) are found around Alps & Himalaya because of compact and thick crust formed due to Intense folding activities. The density of Indian plate is relatively higher with high velocity as compare to Asiatic plate so naturally Indian plate will subduct beneath Asiatic plate . 2.On subducting due to intense heat both plate joined together and cemented at Indus-Yarlung suture zone.Which explains the thick crust formation and height of Himalaya due to intense folding. 3.Now recent theories says the Indian plate is still moving so do Asiatic plate .hence causing disturbance . My question is that if that all happening and without water ( as you explained ) , the Indian plate (after melting ) in mentle will increase the volume there (adding mass for millions of year in mentle ) with no way to come up (No volcano in Himalaya ). Is it popossible that all that volume increasing the height of Himalaya ? If so than how long ? I thought the lack of volcanoes was more about continental plates colliding with no subduction. Prior to the collision of the Indian Plate with the Asian plate, when the ocean floor preceding the Indian plat was being subducted by the Asian Plate, there were lots of volcanic mountains. Is this theory out the window??? You may be right – continent-to-continent collisions provide less density contrast and limited subduction, so we don’t throw away that explanation entirely. But this story tries to emphasize the role that water plays in lowering rock’s melt temperature and presents a view favoured by many geophysicists for Nepal’s lack of volcanoes. As you point out, “when the ocean floor preceding the Indian plate was being subducted by the Asian plate, there were lots of volcanic mountains” – we might suggest that there was also a lot of water involved at the time, too. The lack of subduction is certainly the main cause of volcanic cessation in the Himalaya. Subduction of Techyan oceanic lithosphere occurred between the Cretaceous and Tertiary, with volcanic and intrusive systems forming during two main phases (volcanic-related porphyry and epithermal gold deposits exist in the Himalaya). Since subduction has ceased, lateral/convergent force has been too high to allow partial melt to occur (the higher the pressure, the higher the temperature required to melt rock). Millions of years from present there will potentially being more volcanism or just intrusions associated with a decrease in lateral forces. This is often referred to as “post-orogenic collapse” and can cause the generation of A(anorogenic)-type granitoids and associated volcanics. The role of subduction and pressure are just as important as water and dehydration of subducting crust. Water is only a piece of the volcano story. Thanks! As you said, “The role of subduction and pressure are just as important as water and dehydration of subducting crust. Water is only a piece of the volcano story.” The details and clarification are appreciated.